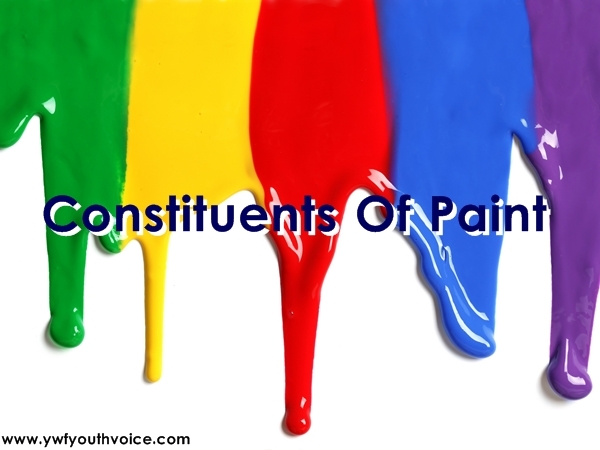 Constituents of paint explained in detail: Pigment, Solvent, Resin (Binder), Extender and other additives. Introduction To Paint And Paint Industries. Pigments are various inorganic or organic insoluble substances which are widely used in surface coatings. The most important properties of pigments are opacity, good covering power, mixing ability with oil, chemical inertness, non toxicity or low toxicity, high hiding power, high tinting strength and reasonable cost. They protect the film by reflecting the destructive ultra violet light, to strengthen the film. a) Natural or mineral pigments: e.g. talc mica, chalk, clays, iron ores, barytes, diatomaceous earth etc. d) Organic dyes: Toners (insoluble organic dyes) used directly as pigments because of their durability and colouring power. Lakes, which are organic dyes on an inorganic adsorbent (such as clay), have also been used in many colours. Para red, toluidine toner, Hansa yellow G (lemon yellow) etc. are important lakes. Clay, barite, aluminum hydroxide etc. are well known inorganic adsorbents. Both toners and lakes are ground in oil or applied like any other pigment. > White: White lead, titanium dioxide, zinc oxide, lithopone. > Red: Red lead, iron oxides, cadmium reds, rouge etc. > Blue: Ultramarine, cobalt blues, iron blues etc. > Chromium oxide: Chromium oxide, chrome green, phthalocyanine green. > Yellow: Litharge, lead or zinc cnromates, ochre etc. > Black: Carbon black, lamp black, furnace black etc. > Orange: Basic lead ·chromate, cadmium orange etc. > Brown: Burnt umber, burnt sienna etc. > Metallics: Copper powder, zinc dust, aluminium etc. > Metal protective pigments: Red lead, blue lead, zinc and basic lead etc. silica, barite, glass flakes, asbestos and anhydrite etc. polymerization of the unsaturated constituents of the drying oil. organic peroxides as the chain initiators. purification. After drying it sets to a hard glossy film. Linseed oil is used in four different grades by paint and pigment manufacturers. Initially PbO was used as a drier, but the modern driers are Co, Mn, Pb, Zn, resinoleate, linoleate and naphthenates etc. They dissolve in the hot oil and the drying time has been much reduced. They are usually mixed with hot boiled linseed oil. Too rapid drying is not desirable because of some unwanted effects, e.g, the film suffers from wrinkling. The drier acts as catalyst and promotes the oxidation polymerization process which accelerates drying of the film. The unsaturated drying oils polymerize by reaction mechanism which involves a peroxide intermediate. In order to dissolve film forming material and to thin concentrated paints for better handling as well as brushing thinner is added. It is also used to suspended pigments. Diluents or thinners may include aliphatic or aromatic naphtha fractions or many contain turpentine. Solvent such as turpentine in spite of its low volatility, maintains the fluidity of the freshly applied film for reasonable period of time. Lacquer is a liquid coating composition containing the basic film forming ingredients cellulose esters or ethers and plasticizers, without or with resin. Lacquers employ aliphatic chemicals, such as ethers, esters, ketones and alcohols to provide the desired controlled volatility. By virtue of evaporation of solvent, they are also called non-convertible coating. When a pigment is added to a clear lacquer, it is called lacquer enamel or pigmented lacquer. Certain anti-skinning agents are also added to the paint in order to prevent gelling and skinning of the finished product before application of the paint by brushing, spraying or dipping. e.g. Polyhydroxyphenols. Plasticizers, low melting solids or liquids of low volatility which provide elasticity to the film and thus prevent cracking of the paint. Chemically, plasticizers are mostly esters. Triphenyl phosphate, dibutylphthalate and castor oil etc are used as plasticizers. Resins are required for water base paints contain no oils and depend on vinyl acetate, acrylic or butadiene styrene polymer resin as the film forming materials. Varnishes are also, used in the form of natural or synthetic resins. Examples of natural resins are copal or rosin, while that of synthetic resins are urea formaldehyde, acrylate, vinyl or silicone resins. Laquers also contain nitrocellulose as the resin constituent. Binders act to fix the paint on the coated surface and provide tough, tenacious and glossy film on the surface being painted. Binders may be of following types. These may be oxidizing alkyd resin (used for house paints, interior paints, air drying under coats etc.) alkyd and cellulose resins (used for making low temperature backing under coats) and alkyd and silicon resins (used for superior chemical and heat resistant coats). Extenders such as clay, talc, barytes etc are added to the paint mix in order to prevent the cracking of the film when dry. Water based paints also require dispersing agents (e.g. casein), antifoam agent (e.g. pine oil) and preservative (e.g. chlorophenol).